His dance partner, Cheryl Burke, canceled at the last minute due to illness. 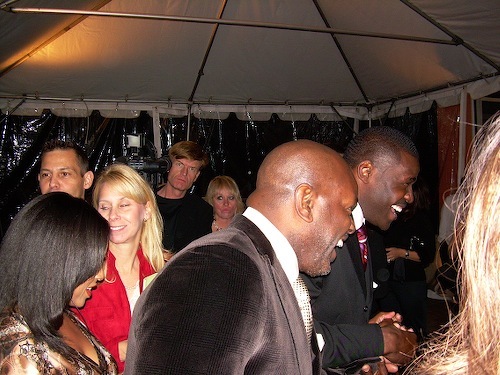 But Emmitt Smith showed up and played the perfect host Tuesday night on behalf of his charitable foundation. "The pleasure's all mine. All mine," he could be heard saying on more than one occasion to well-heeled potential bidders. The night's grand prize, a private dance lesson from reigning Dancing with the Stars champs Smith and Burke, eventually went to three couples who parted with a total of $80 grand. Another $20,000-plus was raised separately, Smith said. An invited crowd mingled in close quarters at the Plaza at Turtle Creek with Smith, his wife, Pat, pro football Hall of Famers Marcus Allen and Ronnie Lott, and possible future honorees Michael Irvin and Tim Brown. Smith's triumphant green dancing costume and shoes were framed for the occasion, and party-goers also could pet the Dancing with the Stars mirror ball trophy. Late in the game, Allen held it aloft and proclaimed, "I want you guys to realize this is gonna be me next year. No way. Just kiddin'." 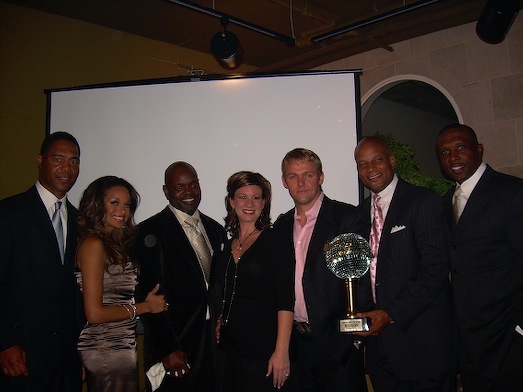 From left: Marcus Allen, Pat Smith, Emmitt Smith, one of the winning couples, Ronnie Lott (with Dancing trophy in hand) and Tim Brown. Maybe Allen should reconsider. Smith, in an interview, said his transformation from bruising running back to Dancing's teddy bear "has opened up a new world of possibilities." Endorsement-wise, "It's totally shifted the dynamics," he said. "I've wanted to be in this position, and I thought football would do it for me. But in the world of entertainment, you've got a lot more women actively engaged in watching. I guess you could say the phone's been ringing off the hook with opportunities. Now I just have to sit back, make the right decisions and capitalize on it." All proceeds from Tuesday's event, co-sponsored by Park Place Maserati, went to Emmitt Smith Charities, which currently is helping fund college educations for 19 disadvantaged students. Those who kicked in the big bucks also won a private dinner at The Mansion, an accompanying bottle of Dom Perignon and a night's stay. Allen urged a hard sell when Smith initially went a little easy on potential bidders. "It's like church, dude," he said. "You've gotta put all the people on the spot. Wash away all your sins." Remember her? Mesquite's Shannon Hughes was runnerup in 2005's Sports Illustrated Swimsuit Model Search on NBC. A recurring guest on "The Ticket" (1310 AM), she's now happily married to her high school sweetheart. But wait, there's a bit more to this story. Postscript: Shannon Hughes of Mesquite also was at Tuesday night's charity event, where she modeled Stanley Korshak jewelry. In early winter 2005, she placed second in NBC's "reality" show search for a Sports Illustrated swimsuit model. Should've won. But here's the punchline. Shannon caught the eye of then Dallas Cowboys' third string quarterback Tony Romo, who asked a sportswriter for The Dallas Morning News to inquire about her availability. The sportswriter than lateraled the ball to me, because I'd interviewed her about the show. Did I think she'd go out with Romo? No, I said, she's engaged and they're already planning the wedding. I hadn't seen Shannon since, so she'd never heard the story. "Nope, I was taken," she said, laughing, upon learning what might have been. Romo since has become one of America's hottest bachelors and Shannon indeed married her high school sweetheart, who's now on his medical residency in Galveston.